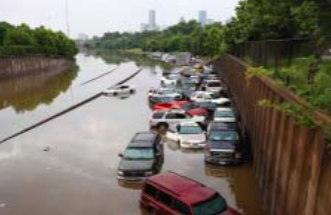 Besides highways and city streets that were impassable, a number of homes throughout the western and northern areas of the city reported water inside their houses. HOUSTON – San Jacinto College has closed on 57 acres at Generation Park, just across Lockwood Road from the 173-acre FMC Technologies Corporate Headquarters currently under construction. As a reflection of McCord Development’s commitment to education and desire to show this by providing San Jacinto College with a prominent location to further their mission, the developer donated 3.8 acres situated at the intersection of West Lake Houston Parkway and Lockwood Road. The rapid growth of new homes and new businesses in and around Generation Park is creating demand for educational opportunities. San Jacinto College graduates truly go everywhere, whether that’s major universities including Harvard, MIT and Georgetown, or thousands of companies throughout Texas. 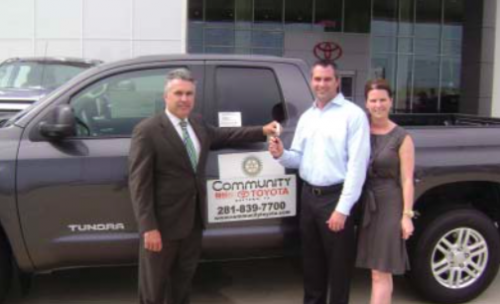 Mike Williams, incoming President of the North Shore Rotary Club, presents the keys to a 2015 Toyota Tundra to raffle winners Mr. and Mrs. Matt Clendenan of Deer Park. NORTH SHORE – The Rotary Club of North Shore held its 40th Annual Fish Fry on May 16 at the Rotary Pavilion on Wallisville Road where about a thousand people attended. A donation of $100 gave you a chance to win a new vehicle, your choice of a Toyota Tundra truck, or a Avalon sedan. Nineteen other prizes were also awarded. Fish Fry chairman Mike Williams reported that the event raised over $150,000 in the live auction, another $160,000 in ticket sales. This money is returned to the community throughout the year, in scholarships, support of youth projects. The vehicle for the winner was provided by Community Toyota of Baytown. The winner, Matt Clendenin, said that he chose the Tundra pick-up truck of the two choices he had. Channelview ISD Superintendent Greg Ollis congratulates Elementary Teacher of the Year Amanda Montemayor and Secondary Teacher of the Year Priscilla Jones on their recent honors at the Teacher of the Year Banquet. Montemayor is a Kindergarten teacher at De Zavala Elementary and Jones is an Algebra teacher at Kolarik Ninth Grade Center. 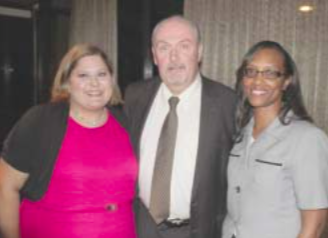 The Channelview Independent School District’s top educators were honored at the 2015 Teachers of the Year and Rising Stars Banquet at Landry’s Restaurant in Kemah on May 28. Amanda Montemayor from De Zavala Elementary School was named the district’s Elementary Teacher of the Year, while Priscilla Jones from Kolarik Ninth Grade Center was honored as Secondary Teacher of the Year. Both teachers now are in the running to become Region 4 Teacher of the Year and will be recognized at a reception later this summer. “We are proud to honor these teachers and recognize their creativity and ability to reach students’ minds in a special way,” said Greg Ollis, Channelview ISD superintendent. The event was sponsored by Tubular Services, LLC, Woodforest National Bank, Gulf Coast Educators Federal Credit Union and Perdue Brandon Fielder Collins and Mott LLP, Attorneys at Law.